Well-designed randomized clinical trails may provide information about prevention strategies and effective treatments for women at risk of or diagnosed with breast cancer. A major limitation of clinical trials, however, is that results apply to the trial group as a whole, but not necessarily to each individual woman. That's because individual responses are influenced by the patient's and the tumor's unique DNA or genetic profile. How might researchers precisely identify risks for individual women based on protein and gene biomarkers to predict outcomes for breast cancer treatment or even prevention? Dr. Jack Cuzick is the director of the Wolfson Institute of Preventative Medicine in London. He's also head of the Center for Cancer Prevention and John Snow, Professor of Epidemiology at Queen Mary University of London. In 2007, he was chosen by Thompson Scientific as one of the 12 hottest researchers in all of science. He was awarded the AACR Cancer Prevention Prize in 2012 and he's been a BCRF investigator since 2011. Chris Riback: I'm Chris Riback. 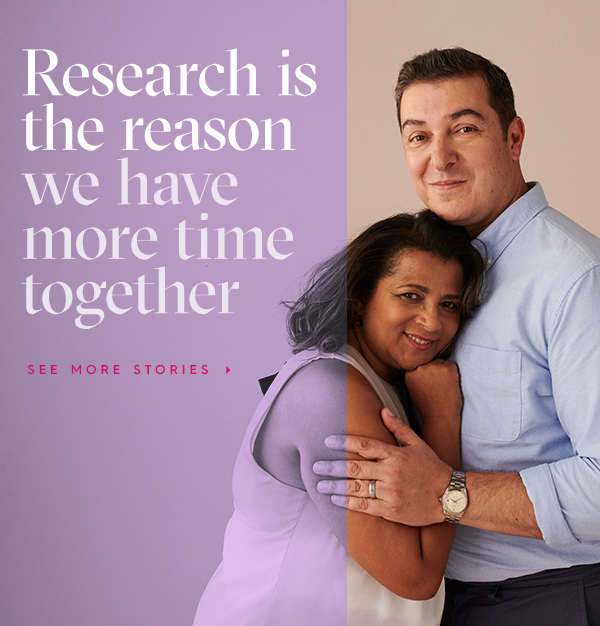 This is Investigating Breast Cancer, the podcast of the Breast Cancer Research Foundation and conversations with the world's leading scientists studying breast cancer prevention, diagnosis, treatment, survivorship, and metastasis. Well-designed randomized clinical trails may provide information about prevention strategies and effective treatments for women at risk of or diagnosed with breast cancer. A major limitation of clinical trials, however, is that results apply to the trial group as a whole, but not necessarily to each individual woman. That's because individual responses are influenced by the patient's and the tumor's unique DNA or genetic profile. As one cancer research site puts his impact best, Professor Cuzick's work on breast cancer treatment and prevention has been instrumental in reducing the number of women losing their lives to the disease. Before my conversation with Dr. Cuzick though, one last item, an ask from me to you. I hope you like these investigation breast cancer conversations and, if so, I'd appreciate if you'd take a moment, go to iTunes, and if you're so moved, leave a five star review. The ratings really matter. They go a long way to helping other people find the podcast. Thanks for considering. Okay? That's it. Here's my conversation with Dr. Jack Cuzick. Dr. Cuzick, thanks for joining me. I appreciate your time. Dr. Cuzick: It's a pleasure to talk to you. Chris Riback: I know this conversation is about breast cancer research, but I confess as I did my own research, I started to find myself even more curious about your apparent mastery of time management. You're the author of 520 peer review papers across all major journals? How in the world does anyone have the time to create or generate that many of anything, much less 520, it's probably more by now, peer review papers? Dr. Cuzick: I think it's 680 right now. Chris Riback: Wow. That explains it because my data was from last week, so I guess that's the gap. Dr. Cuzick: Well, I think my work is collaborative and I work with lots of different people. By no means have I written all of the words in all of those papers. [crosstalk 00:03:08] It's very much a collaborative subject, so I have lots of collaborators around the world. Chris Riback: So that's the burden of being able to get along with other people? Chris Riback: You also made quite a statement, transitioning from extraordinary output and time management towards breast cancer. You made quite a statement back in 2014 and then we'll kind of fast forward to what you're working on now and I'm sure you've made other extraordinary statements since then, but this is one that I read. It was back at the San Antonio Breast Cancer Symposium. When you said, "Breast cancer is the epidemic of our century," what did you mean by that? Dr. Cuzick: I think you only have to look at the incidence rates around the world and you can see that most cancers are either going down or fairly stable, but particularly in the developing world, breast cancer continues to roar up at terribly high rates. Not so high in the United States, it's fairly stable there, probably because of the fact that the rates are already pretty high. But what's happening really worldwide, is everything we know about breast cancer in terms of risk factors is going in the wrong direction. Obesity is a risk factor. Late age at first childbirth is a risk factor. Use of hormone therapy is a risk factor. All of these things worldwide are increasing and that's very much the explanation. Chris Riback: Let's talk about risk factors because obviously one of your main areas of focus is to improve risk assessment in high risk women by identifying protein and gene biomarkers. That's among the current work, is my understanding that you're working on. If I have any of that, obviously you'll correct me in a highly polite and collaborative way I'm sure. Help me understand two parts of that and of your work. One, what defines high risk women? You just talked about some of those factors, but how do you determine that in terms of your own definition? And then, how do you evaluate risk within this group? Are the measurements more sensitive say for them because of their family histories or the other factors? So help me ... let's dig in a little bit really on that term risk. Dr. Cuzick: You've chosen a very active and fluid area at the moment. We started out in our first prevention trial, IBIS-I, we had specific risk factors that would qualify to be high enough risk to be considered for preventive therapy. And when, because we couldn't fit everyone in, we had a final category, which was at high risk as judged by the PI of the study, and that was me and to help me, I created a program which allowed you to combine risk factors in ways that allow you to assess risk. And basically high risk was considered to be twice the population risk at that time. Now since then, that program has achieved a much wider use and is used not only for high risk women, but for lower or slightly above average risk. It is the basis for most insurance companies in the United States determining who's eligible for MRI screening. I was at a meeting last week and told that this is currently a three-billion-dollar business and it's very much determined about whether you get it is the use of our risk program. Chris Riback: That's fantastic, obviously. And so, it would seem if I'm interpreting this right, the extension of that definition, I assume, is very helpful because that's getting more women into the prevention or at least the ability to determine their status and I would assume then, you know, pick up things sooner, so quite an important contribution. Talk to me then about the biomarkers. I saw the term "biological signposts." So if you could just take me through ... how does that process work and in layman's terms, what are protein and gene biomarkers? Dr. Cuzick: Yes, the program started out originally as just a questionnaire-based program in which we looked at things like family history, prior benign disease, weight, use of hormone replacement therapy, whether you've had children or not and produced a risk profile. We've now expanded that in the current version which is version 8 which shows you how much change there's been, to include not only questionnaire data, but also mammographic density which is a very important factor. Many people only are aware of the fact that mammograms are used to detect cancer early, but in fact they turn out to be very, very useful for determining whose at high risk. White areas on mammograms which is dense tissue, which is not fatty, but it's actually epithelial tissue or fibroglandular tissue, having more of that increases your risk of breast cancer. That's an important additional factor and then the third area, which you referred to, is to begin to look at genetic factors and, in fact, although there are a couple of well-known genes, BRCA-1 or BRCA-2, that give a very high risk of breast cancer, they are very rare, less than half a percent of the population has them. So in terms of assessing risk in a population, they aren't that useful and they're really only useful when there's a strong family history. Now it turns out that there are a number of other genes that individually have very small risks, like they may increase or decrease your risk by five or ten percent so, individually, they're not very important, but there are now 147 of them and if you did a profile and looked for all of these, you begin to find patterns where some women may have 10 or 15 of these increased. Some of them may have that many decreased. So it begins to add another layer of risk stratification. Not only these very small high risk genes or very rare high risk genes with bigger risks, but a whole panel of a large number of genes which individually carry a small risk, but overall can tell us a lot more who's at increased risk of breast cancer. So in our most recent analyses of these data, we found that the three factors, that is questionnaire data, breast density and these so-called nuclear-type polymorphisms or genetic factors, each are quite independent of each other and about the same strength, so they all contribute about one-third to our risk predictions now. Chris Riback: As I have these conversations, I'm fortunate enough to get to talk with leading researchers and scientists such as yourself. A number of things really stand out. One of them is what you just mentioned. The coming together of different strands of research. So I can imagine that once upon a time, and you kind of just went through this a little bit, once upon a time you looked maybe primarily or solely at the questionnaire data and then you layer on other findings and you find connections with mammography and the breast density out of that and you layer that in and then we start to learn about the genetic factors and one in particular may have only a five or ten percent increase of risk, as you're stating. But as you start to understand the interplay among them and then the interplay among all those factors, is the openness to those types of connections, is that a key part of scientific research from your point of view or is it going down deep in one particular area and contributing that to the scientific findings? Dr. Cuzick: I think our research is very much focused on kind of the big picture things, so one of my key areas is determining who is at high enough risk to warrant preventive therapy. And in the UK, there's a committee called NICE, or the National Institute for Clinical Excellence that said that if your ten year risk is eight percent or higher, your doctor should talk to you about preventing therapy. That's about a three-fold risk. If it's between five and eight percent, a two to three-fold risk, they should discuss it with you but recognize that there are risks and benefits that may be more of an individual decision. So that's one place where some of this has come from and that indicates this sort of wide need. By putting up all of these different factors, both questionnaire data, density data and the genetic factors, we're able to separate the population more into the higher risk and more into the lower risk and as a result of this, there has become an increased interest in the fact that maybe we should be thinking about what's called precision stratified screening in which a woman gets a chance to have her risk assessed to determine how much screening she really needs. Some women are going to be at low risk. If your risk of breast cancer is say less than one percent in ten years, you probably don't need regular screening and how much you need is an open question, but can probably be every five years. If you risk is up in that five to eight percent or higher, you probably need more screening, you should be screened more regularly than in the UK. Annual or biannual certainly makes sense. If you have dense breasts, we know that mammography has limited sensitivity there, so that density area not only tells you that you're an increased risk, but we should be looking for new and better ways to actually screen women, because once there's this white density on the breast, you can't see the cancer so easily. There are new methods that can actually see through that. Chris Riback: Tell me, if you would, about the Biobank and the clinical trials that you're running there. Dr. Cuzick: Yes, we've felt very strongly that in our prevention trials of women known to be at high risk, we should not only be trying to lower their risk with preventive drugs, but to understand more of a why they're at high risk and which preventive treatments might work best. So, altogether, there have been probably 15,000 women in our IBIS-I and IBIS-II trials and the precursor, Royal Marsden trial, in which we collected a baseline blood sample. If they get breast cancer, we try to get the tumor blocks from that breast cancer, which can be a lot of work sometimes. And with those blood samples and with the tumor blocks, we're actually now making good progress in determining different types of breast cancer and the goal is to determine which kinds of breast cancer will respond to different kinds of preventive treatment. Chris Riback: And if we were to look back and the extraordinary accomplishments that you've already made to this field and you've been doing it for a number of years, I know, you were the first, I believe, to report the effect of tamoxifen on contralateral tumors as an indicator of its potential of chemo preventative role. How instrumental, I mean, as you look back at your finding, that's really made an incredible impact as I was reading about it, ever since then. Tell me about that original finding and the effects of what you found, vis-a-vis, tamoxifen. Dr. Cuzick: Thank you for reminding me of that. I started my work in breast cancer as a statistician analyzing the adjuvant trials in hormone therapy and I worked with Mike Baumann at that stage and being the statistician and being interested in the biology, I had really good access. I had all of the data, plus access to some of the great experts in the area and one of the observations that came out of one of the early trials, which we published in 1985, was that not only was tamoxifen reducing recurrence, that is in the breast or a systemic recurrence, but new tumors in the opposite breast were also reduced. So we reported that in one trial in 1985, but since been confirmed in many trials and also been confirmed to be useful for the aromatase inhibitors. So it's one example of sort of the repurposing of drugs, if you like, and breast cancer is unique in that women have two breasts and they tend to only get cancer in one of them at a time and the treatments you give to actually try to reduce recurrence of that cancer can also be monitored for the effects on new cancers in the opposite breast, so it's been a unique and extremely valuable way of identifying agents that are going to be good for prevention. Chris Riback: And in terms of the getting here, given your work credentials and given the fact that we're talking right now and you're in London, I confess I was fully expecting to hear a British accent. And then I saw that you're a California kid, so take me back. What happened? You couldn't take the California weather and you had to head to London? Dr. Cuzick: Well, there's various phrases about that. I like to say that 20 years of sunshine is enough to last you for a lifetime, so I spent my first 20 years, I grew up on the beach in southern California as a surfer. I'm really a displaced California beach bum. But, I was ready to do something else, so I must say I then moved to New York and spent about four or five years at Columbia and then onward east to London and I've really enjoyed, sort of the European mentality is what I find really very striking. I loved New York as well, but the children came along and I think we found it very difficult to raise children in Manhattan. Chris Riback: Yes, they certainly can get in the way of all sorts of plans, can't they? You know, those darn kids. Dr. Cuzick: I'd love to come back to New York, but London is my home now. Chris Riback: And you talk about the European sensibility or mentality. Is that a medical and a research point of view? Do you mean it from there or just kind of lifestyle and that sort of thing? Dr. Cuzick: I mean lifestyle and culture. I think that ... and mind you I find that while New York is an exception, because I always like to say that New York City has nothing to do with America, it's a whole other country in terms of culture, mixing both American and European culture, but I do like the sort of interest in a broader range of things. I do like the fact that within an hour's airplane flight you can be in a completely different culture. We have the European Union, but it's still a range of different countries, there isn't quite that spectrum of variability across the United States, so I've enjoyed that enormously. Chris Riback: And the science and medicine and research, you said that you started out I guess as a statistician, but you obviously spent a career in that and related fields. Going from self-described beach bum to scientific research, that diagram, maybe it's bigger ... the overlap is bigger than I would assume, not having looked at the data, but was it always for you, science growing up, science and research or at some point did you have thoughts of writing poetry or anything like that? Dr. Cuzick: I guess I was very good at mathematics from about age two, so my career path was one I didn't have to spend too much time thinking about. I love theoretical physics and thought originally when I went to college that I would end up being a theoretical physicist, but in fact in my college years I found the excitement of mathematics and the ability that this is a language you can use for a whole range of different areas, is something that really attracted me so I kind of shifted from physics which is a beautiful field to more mathematical things, where it's a language which allows you to reason in any kind of scientific area that's of interest and even poetry. Chris Riback: It's a language that gets spoken across all borders as well. And as you talk about your research, obviously any type of research benefits from and requires, I would think, the support from a range of areas and you've had through your career just a number of outstanding and incredible and, I'm sure, highly influential relationships and institutions that have supported your work. The world that BCRF has played in your research and is playing in your current research, describe that for me. Dr. Cuzick: The BCRF has been really important in terms of being able to get the most out of all prevention trials. They provided support for us to go and collect the biopsies, collect the blood specimens, to collect the mammograms where possible, so we've been able to do scientific research, you know, next to the prevention trials and it's been really very important. We were the first to actually look at these genetic factors, these snips in large research trials and identify that they ... even in women at high risk because of the family history or other factors, that these things actually do modify that risk, pushing some even higher and pushing some down a little bit lower. And that's only really been possible because we've had the support of BCRF to go out and collect this material. Chris Riback: And, breast cancer, to be clear is not the only area that you have done work on and do focus on. If I'm not mistaken, there's prostate cancer, cervical, bowel cancers. It's also struck me as I've had the privilege of talking with folks like you, the connections and the learning that goes on in one area of cancer research and how that, maybe hypotheses or findings or hunches then get applied to other areas. Is that true? Have you found that true in your work as well, I assume? Dr. Cuzick: I think it is. Yes, there are certain common things that one can carry across. So, for example, much of my work in cervix and colorectal and, to some extent prostate has been in screening and I've also been involved with breast screening. And one of the principles that became most apparent initially really in cervix is that rather than using a mediocre test like Pap smears or cytology annually, you're better off using a really good test like testing for the human papilloma virus which is the cause of cervix cancer infrequently, you can test half as often and get twice the benefit in terms of disease, so that's been something that I've carried over to other areas. You know, screening is something you should do as infrequently as possible with the best possible test. HPV has been something I've been very heavily involved with in cervix cancer. We did the first big endoscopy trial in colorectal cancer and, again, rather than just looking for blood in the stool with caustic, either FOBT or FIT tests, an endoscopic screen that actually looks and removes not only the cancers, but the precursor polyps is much better in terms of getting a substantial overall benefit and only needing to be done probably once every ten years. I think that that challenge is now coming into breast cancer. Can we improve on mammography and begin to identify, for example, one of the areas of interest is the MRI screens tend to be picking up two to three times as many lesions as mammography. Can we do that less frequently with some new methodology that's not so expensive and still get more benefit than the cost of mammography? So that's been kind of a theme of mine is to try to do better tests less frequently. Chris Riback: Dr. Cuzick, what other areas are you most interested in? Dr. Cuzick: I think my interest really is very much focused around cancer prevention and recently we've been excited by a new area. Everybody knows the single most important thing to do to avoid getting cancer and it's to not smoke cigarettes or avoid tobacco use. But, if you ask people what's the second most important thing you can do, they rarely give you what I think is the correct answer. I mean, there are things like obesity, physical activity, these are all important but, in fact what is emerging is the second most important thing is to take a low-dose aspirin for about 10 years between the ages of 50 and 70. And the reason it's taken so long to find that is not much happens for the first three years or so, but after that you get very striking, more of the benefits, particularly for the three gastrointestinal cancers, about a one-third reduction in bowel cancer, a one-third reduction in stomach cancer, a one-third reduction in esophageal cancer, plus smaller but important reductions in breast, prostate and lung because these are very common cancers. When you put that all together, it emerges that taking a low-dose aspirin can reduce your cancer risk of mortality by more than ten percent and that's second only to tobacco in terms of its impact. Chris Riback: That's extraordinary. So is that a baby aspirin or that's a low-dose adult aspirin? Dr. Cuzick: No, it's the baby aspirin, which the dose is different in different countries. It's 81 in the United States and it's 75 in the UK and 100 in Europe because it's a quarter of a standard aspirin. A standard aspirin is 325 in the states but 300 in the UK, so yeah, it's the baby aspirin used initially in ... and what happened was that lots of trials were done to evaluate its impact on cardiovascular disease and they showed pretty clear benefits there, but most of those trials that followed, would stop within five years. Peter Rothwell and colleagues in Oxford had gone back and looked at the 20-year followup and to everyone's surprise, there was this huge benefit on these major cancers that really shows up after about 3 years and has really led to my great excitement about really making this much more commonly available and used. Chris Riback: Thank you. Thank you for your time and, of course, thank you for the work that you have done and continue to do. Dr. Cuzick: Thank you very much. Pleasure talking to you. Chris Riback: That was my conversation with Dr. Jack Cuzick. My thanks to Dr. Cuzick for joining and you for listening. To learn more about breast cancer research or to subscribe to our podcast, go to BCRF.org/podcasts. Learn more about Dr. Jack Cuzick and his research on clinical trials.